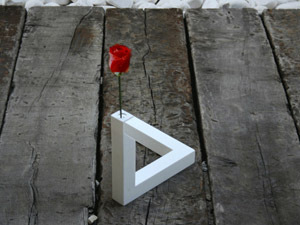 As Freshome first reported, there is a new optical illusion toy in town, more specifically an impossible triangle vase. If you were looking for the perfect vase to match your favorite plant, 90° just may be the winner! Originally designed by Cuatro Cuatros, the product is based on a heavily familiar drawing of an impossible triangle, converted into a geometrical shape with volume. 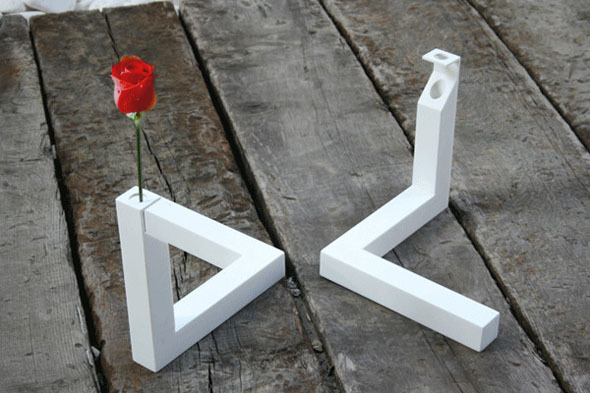 We’ve featured over a dozen such triangles in our impossible objects section, yet and the only problem with this vase -is that it only works when seen from one certain angle. Depending on the point of view, both ends coincide and make it look like a closed figure. The interposition, orientation and perspective create a contradiction of the space that makes us perceive something that is not. 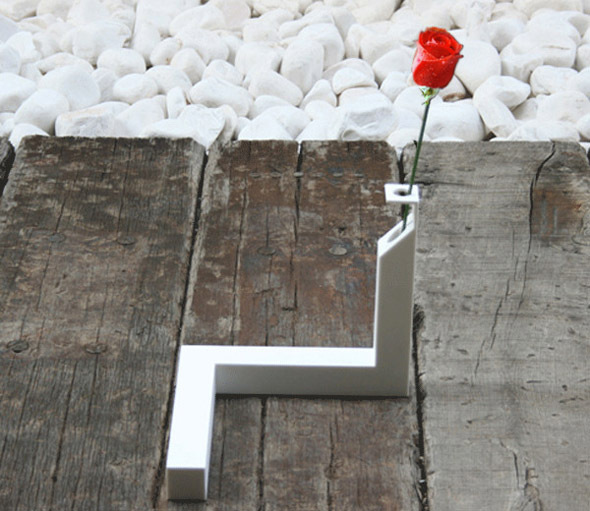 This way, the vase becomes more than just a functional object, turning into a decorative piece that plays with perception. You can place it anywhere inside your home, as its clean, simple shape can pleasantly interfere with both a modern and traditional decor. 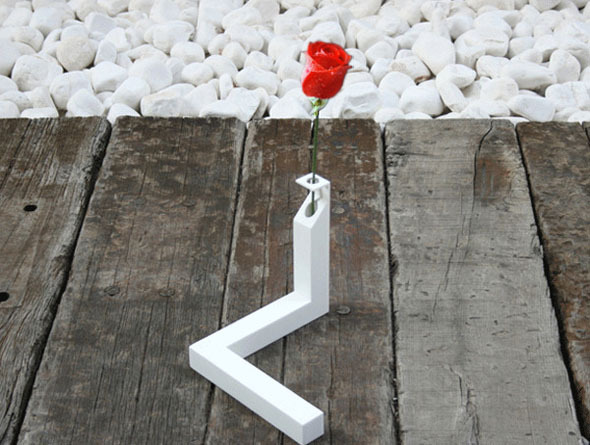 Just put some water inside the crazy triangle vase and watch how the flower blooms in the company of an awesome optical illusion! Very well done. Even seeing the different angles it took me a minute to fully understand how it was done. Would be nice to have one for the home but I can see that the illusion would only work it one was stood in exactly the right position. Now, if you can figure out a way to keep the flower fresh, that would be a real achievement. Very cool, though there is a much simpler way to construct such an “impossible triangle” out of just about any material. You can find the design in “A Simple Design For An Impossible Triangle,” Perception, 1979, vol. 8, pp. 349–350 (in which I was the lead author). I am really enjoying these. I removed news and added this to my igoogle! Glad I did! love all of them . I see you are already trying out the new background. I can’t wait for the rest of the new facelift to come though I am kind of disappointed that you still went for the gray bar when many people have already agreed that the gray bar should disappear. But I digress; lovely combination of optical illusion with aesthetic value of interior design. I wonder if anyone will ever bring it upon themselves to set up a room full of these little optical illusion tidbits. Heck, I believe if someone wants to go for creativity and originality, I can imagine an entire made up of optical illusions. This is a very special idea and I would buy this if I knew who offers it. This is really great. View which is parallel to a vector (-1,1,-(2/3)^(1/2)) will give us this illusion.